Paranormal investigator Hellboy is Injustice 2's newest DLC character. Check out his slick intro video and get ready to play him starting November 14. The big red Dark Horse comic icon, Hellboy, is finally crashing the Injustice 2 battleground! He is the last Injustice 2 DLC character from the second fighter pack trio together with Aquaman‘s nemesis, Black Manta and the Mortal Kombat key character, Raiden. Hellboy is a fictional superhero created way back in 1993 by writer-artist, Mike Mignola. Supposedly destined to be a summoner of beasts and hell spawns (the Beast of the Apocalypse), he became a paranormal investigator and devoted his life to fighting evil forces instead. The character appeared first in San Diego Comic-con Comics #2 (August Issue) and various comic crossovers. 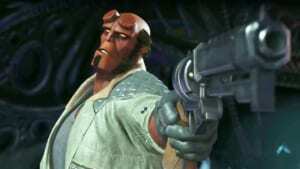 Hellboy then gained mainstream recognition through its two live-action feature films in 2004 and 2008, where the character was famously portrayed by Ron Perlman. In Hellboy’s introduction video, he battles DC characters such as Atrocitus, Cyborg, and Scarecrow. He uses his iconic revolver and absurdly oversized “Right Hand of Doom” to strike down his opponents heavily. The video also reveals Hellboy’s super move in which he takes Atrocitus down to hell and back. This character move shares some similarities and inspiration with Mortal Kombat 10’s Scorpion super move. Hellboy’s half-demon alter ego, Anung Un Rama, is also shown in his post-victory scene where he gets a fresh set of horns and a flaming crown. Hellboy is scheduled for release on November 14 for those who purchased the “Injustice 2 Ultimate Edition,” “Injustice 2 Digital Deluxe Edition,” “Injustice 2 Ultimate Pack,” or “Fighter Pack 2.” The Injustice 2 DLC character will also be publicly available on November 21 for $5.99. As for Atom, Netherealm announced a release date inmax December 2017. Their purchase is available both on PS4 and Xbox One–and presumably PC. Check out Samurai Gamer’s Injustice 2 wiki for more on information about other Injustice 2 Heroes, Villains, and DLC characters.